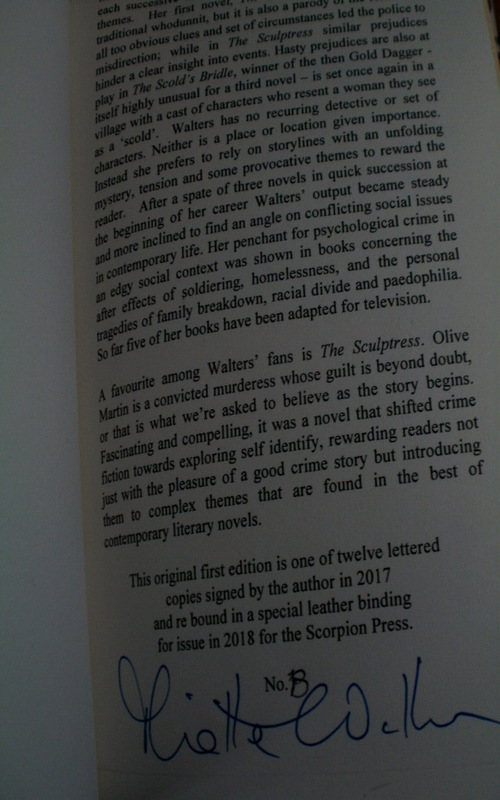 This is a 1st edition of THE SCULPTRESS, just one of 12 lettered rebound copies signed by the author Minette Walters on a special page. Sumptous leather with five raised bands, marbled sides and endpapers. 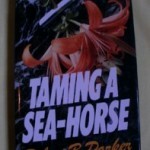 Posted in Crime Fiction Firsts, Psychological. Tagged as Minette Walters, rebinding. This is a 1st edition of THE SCULPTRESS, just one of 12 lettered rebound copies signed by the author Minette Walters on a special page. Sumptuous leather with five raised bands, marbled sides and endpapers, Scorpion logo in gilt. For crime fiction readers from the early 90’s until 2007 Minette Walters was a name that dazzled for the ingenuity of each successive novel – each with different characters and themes. Her first novel, The Ice House appears to be a traditional whodunnit, but it is also a parody of the form. The all too obvious clues and set of circumstances led the police to misdirection; while in The Sculptress similar prejudices hinder a clear insight into events. Hasty prejudices are also at play in The Scold’s Bridle, winner of the then Gold Dagger – itself highly unusual for a third novel – is set once again in a village with a cast of characters who resent a woman they see as a ‘scold’. Walters has no recurring detective or set of characters. Neither is a place or location given importance. Instead she prefers to rely on storylines with an unfolding mystery, tension and some provocative themes to reward the reader. After a spate of three novels in quick succession at the beginning of her career Walters’ output became steady and more inclined to find an angle on conflicting social issues in contemporary life. Her penchant for psychological crime in an edgy social context was shown in books concerning the after effects of soldiering, homelessness, and the personal tragedies of family breakdown, racial divide and paedophilia. So far five of her books have been adapted for television. Special signed limitation page with overview of Minette Walters’ work. A favourite among Walters’ fans is The Sculptress. Olive Martin is a convicted murderess whose guilt is beyond doubt, or that is what we’re asked to believe as the story begins. Fascinating and compelling, it was a novel that shifted crime fiction towards exploring self identify, rewarding readers not just with the pleasure of a good crime story but introducing them to complex themes that are found in the best of contemporary literary novels. 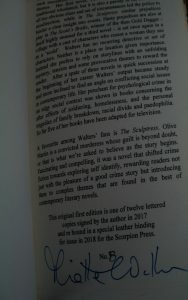 This book was signed in 2017 and rebound for the Scorpion Press for issue to subscribers in early 2018. 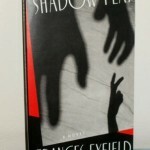 It is supplied with original dust jacket. 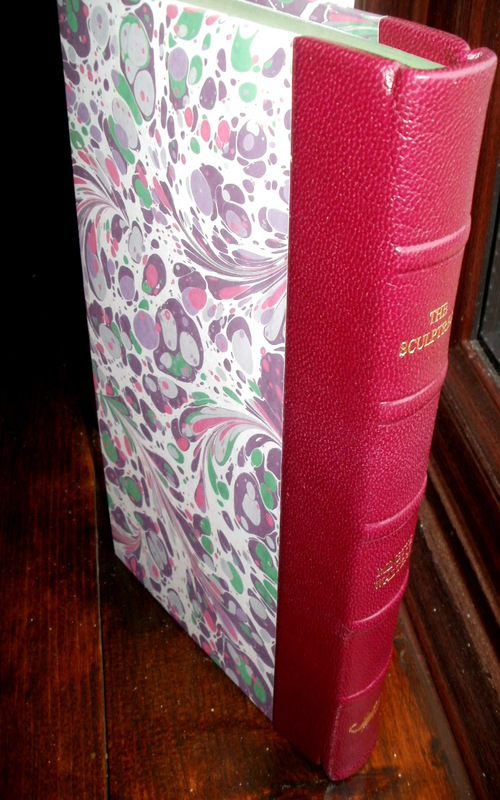 Scorpion Press had previously published a signed limited edition of The Scold’s Bridle in 1994 – which sold out.